You're invited to our flash poetry competition for National Poetry Day! Do you scribble sonnets in your spare time? Are you partial to a bit of rhyme? Or do you want to start writing but don’t know how? 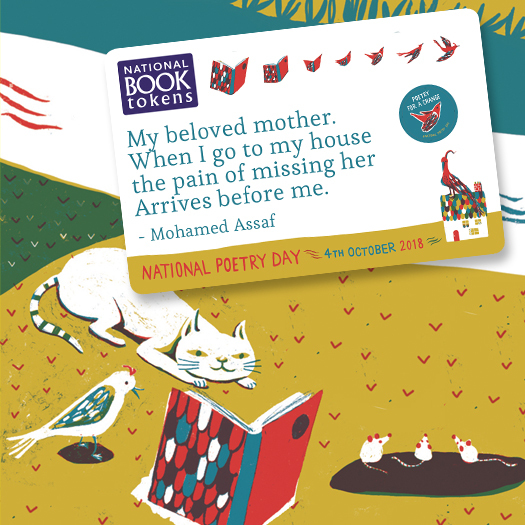 To celebrate National Poetry Day on 4th October, we're giving one lucky Caboodler the chance to win a gorgeous £100 personalised National Book Token featuring their poem, as judged by poets Kate Clanchy and Joseph Coelho. The winner will also get a box of new poetry worth £300, including The Forward Book of Poetry 2019, which brings together the best contemporary poetry in the UK. Quick! Send us your poem before midnight on 7th October*. We received more than 2,500 wonderful flash poems for our National Poetry Day competition and we're delighted to announce that the winner is... Alison Jacobs from Lincoln! Kate Clanchy said: "I like the barcode image inserted in the romantic landscape. It isn’t just a clear analogy. It refreshes our view and takes us inside the poet’s twenty-first century mind- a real flash of insight". Alison has won her poem on a £100 National Book Token and a bundle of poetry books. Congratulations! Why not give someone the gift of your poem on a National Book Token? Kate Clanchy was born and grew up in Scotland. She is a writer in several genres, and has won the BBC National Short Story Award for her fiction, a Forward Prize and the Saltire Prize for her poetry, and the Writers’ Guild Award for her much acclaimed memoir Antigona and Me. She is the Writer in Residence at Oxford Spires Academy, working with pupils on poetry. A collection of their poetry, edited by Kate, has been published entitled England: Poems from a School. Joseph Coelho is a performance poet and playwright. He has been a guest poet on Radio 4's Front Row and performed poems for Channel 4 and CBeebies Radio. His debut poetry collection Werewolf Club Rules is published by Frances Lincoln and won the CLPE CLiPPA Poetry Award 2015 amd his most recent collection Overheard in a Tower Block was longlisted for the Carnegie Medal. He is a National Poetry Day Ambassador. Lots of the best poems in the world are very short. They light up your mind in a flash, and give you an image which shows what the poet sees and feels. 12-year-old Mohamed Assaf's poem, left, perfectly sums up the feeling of loss. Try making your own memorable image. Remember your five senses and list them down a page. Now write down the name of a favourite place, and note down what it smells, tastes and sounds of; what it feels and looks like. Avoid abstract big words and long adjectives. Try the same exercise with the name of a friend, or an idea like ‘hope’ or ‘nationhood’. One of these lists will be your poem – look for the oddest one, the one that sounds most like you. Please note: *The competition entrant must be aged 16 or over. However, you are welcome to send in poems on behalf of younger children as long as the person submitting the entry is aged 16 or over. A minimum of one poem and maximum of 10 poems can be submitted per entrant. Closing date: 11:59pm, Sunday 7th October 2018. Entrants can submit poems on behalf of those under the age of 16.